Zombies. They’re the monsters of the day, it seems. You can’t stroll down the street without some shambling horde following after you demanding ‘brains, brains, BRAINS!’. Why zombies? Why now? What does it all mean? Is it some zeitgeist statement of the world we live in, one of mindless desire, of purposeless hunger, of the infection that spreads the inanities of modern, meaningless existence, the realisation we are just shuffling along this mortal coil driven by no higher purpose than the need to feed? No idea. Zombies are cool. Now, the one thing about zombies are they’re there to be made fun of. Okay, they are scary, but they’re slow, simple and frankly, repetitive. The fright factor’s gone. Welcome to the Forest of Hands and Teeth and the world of the Unconsecrated. It’s a world no bigger than a village, surrounded by a fence, surrounded by a forest, surrounded by a world with nothing but zombies. Their moans drift eternally through the branches of the trees. They endlessly search the fence for the flesh beyond. There is nothing else. Except, perhaps, the legend of an ocean. Mary has grown up with such stories, of the vast water, the endless openness of the sea and sky. The freedom of such a place without fences, without the forest. It is bleak. I fact I would consider this one of the bleakest books I’ve ever read. Mary’s world is one from the Dark Ages, all the glories and wisdom of our world of science and knowledge has been left far far behind and long forgotten. It is a world where the Sisterhood rule with an iron, inflexible will and to defy them is to risk being abandoned beyond the fence and amongst the Unconsecrated. But Mary is convinced that something exists beyond the village, she doesn’t believe they are the last humans on Earth, the chosen of God. Then Gabrielle arrives. Mary sees, trapped within the Cathedral, a girl in red. An Outsider. She discovers in that instance, that there is more to the world than the village, than the Cathedral, the Forest of Hands and Teeth. The story is a quest, in the truest sense of the word. It’s about Mary’s search for freedom from the world she was born, and trapped, within. But to break free of her society takes huge courage and will involve pain, suffering and hard lessons. Carrie weaves within Mary’s story the lives of her closest loved ones. Brother Jed, Cass her best friend. Harry and Travis, brothers who tear Mary’s heart apart. The one she desires and the one she needs. Together with a young boy, Jacob, they flee their village when it is over-run, and must make their way towards a new world, the village of Gabrielle and to the ocean, if it exists. Carrie’s world-building is second-to-none. The Sisterhood could easily be the bad guys but, given the trouble the world’s in (hey, zombies), you can completely understand their fear in making sure everyone toes the party line. I even caught myself (more than once) thinking, ‘Mary, you’re being selfish! Just listen to Sister Tabitha!’ There can be no weak links in society when it’s on the very brink of destruction. Complex, chilling and tense to the nth degree The Forest of Hands and Teeth is a novel that gives no easy answers and neat, ‘tied with a bow’ endings. So, without further ado, let’s find out what’s going on within that big brain of Carrie’s (brains, brains, BRAINS! Sorry, had to put that last one in). 1. Most zombie novels are somewhat (recent) post-apocalyptic world while yours is firmly early medieval. Technology has long gone, the Church controls all aspects of life and duties are very much split along gender lines. Can you tell us a bit about how you came to decide this setting? Ever since I saw my first zombie movie in law school I’ve been obsessed with how we (individually and as a society) would survive a zombie outbreak. Most books and movies focus on the immediate aftermath but I was fascinated with what would happen long after that: when zombies weren’t the new scary monster but were a part of everyday life and had been for several generations. So Mary’s world is actually the future: about 150-200 years after the Return (the zombie apocalypse and I’m purposefully vague about when that takes place but it’s in the near future). But when I started to sort through the realities of a post-zombie world, I realized how quickly society would regress, especially if you removed books and the ability to create a collective memory. Suddenly, the only information available is what’s passed down orally and while many cultures in the past have had fantastic oral traditions, our current society isn’t really trained for that -- we rely on books and computers and the internet. Whenever I’m talking to readers who live near the coast of the US they usually laugh at the idea that a whole village could forget about the ocean and then I ask them to name the Great Lakes. Only about 5% of the readers I talk to (who don’t live near them) can name all five Great Lakes and I use that to prove how easily information is lost. Besides, if you were facing the zombie horde and passing down stories to the next generation, would you remember to say “Oh and there are these lakes really far away and here are their names just in case you need to know.” And even if you did, would that next generation remember them all and also pass them down? A ton of information would be lost (how much do each of us know about our great-grandparents? Already memory is fallible and porous.). As for the aspect of religion, that came naturally to the setting (the village was created by nuns who’d been nursing infected soldiers fighting the zombies in the Forest after the Return). First of all, I thought it would be natural that a village like that would spring up around a defining aspect such as religious conviction but second of all I wanted to show the strain between a governing body that withheld information and knowledge as a means of control and through that control protect the people and how in the end that takes away people’s right to make their own informed decisions about their lives (more on that in the next question). And you’re definitely right about how much of the village is split along gender lines, I did intend to make it a matriarchic society -- in the end, the women have the power. 2. Mary’s conflict is between her desire for freedom and her duties towards the greater community, her village and society in general. This theme is central to the book and made me think about Billi, my own heroine, who makes the opposite choice to Mary and chooses to forgo individual freedom for the good of the group. Did you ever feel Mary was in the wrong, especially when she goes so strongly against everyone? She says ‘her life is not her own’ but is anyone’s? This is one of the exact questions I wanted readers to ask themselves. I do think that at times Mary is selfish but I also recognize that in that world often being selfish is what keeps you alive. Mary’s entire village is selfish because they close themselves off from the rest of the world (withholding their resources) in order to keep themselves safe. I think one of the issues I tried to raise is that Mary was never given the true choice between individual and community because so much information was withheld from her. In part, I think this often mirrors our world where it’s easier for those in charge (from parents to governments) to hold back information hoping that we’ll make the decision they want because we’re not informed otherwise. Many times this leads people to make stupid uniformed decisions with lasting consequences. Is this the right course of action? Some people think yes and others think no. I don’t know if that if Mary and those who came before had been told more about their situation if they’d have chosen a different path. There are times when she does put her own self interest aside for that of the community and times she doesn’t (I’m wary of being specific because of spoilers). I do think that it was Mary’s quick thinking that often kept her group of friends alive and it’s too easy to discount the agency of those around her (i.e. to think that Mary caused what happened to them -- everyone in the book had their own choices to make). More than anything, I didn’t want anything in the book to be too simple. It’s not so easy to say “the Sisterhood lied and therefore are evil” because they did so out of love and a fierce desire to protect their charges. 3. Tell us a bit more about the two men in Mary’s life, Harry and Travis. Travis starts off the desire-able one, Mary’s passion for him is only second to her need for the ocean but as the story progresses we begin to see the leadership qualities of Harry. How did the two brothers develop? Was this something you planned from the start or something that grew organically? I think the love triangle was both a little bit of both something that I planned and that I grew organically. My theory on love triangles is that while it may appear it’s as simple as a heroine (or hero) choosing between two love interests that it’s really about the heroine figuring out who she is and each love interest reflecting a different part of her. I wanted both Harry and Travis to be wholly viable options -- one represents a calm stability, a very comfortable life, and the other represents a more reckless passion and uncertainty. It’s then up to Mary to decide who she is: is she someone who wants a calm and comfortable life or is she someone who would embrace passion even if it potentially comes with great risks? Once she figures out who she is, it’s easy for her to figure out which love interest bets fits with that part of her. It was really important that this not be an easy decision for her -- I remember watching the movie Sweet Home Alabama several years ago and I felt like that was one of the first times I ever noticed that a real love triangle should involve a real decision, it shouldn’t be so lopsided because then it’s just a trope. At the same time, I also wanted to develop Harry and Travis’s relationship -- the camaraderie and competition between them. They’re both trying to do what they think is best for the other and at the same time getting in each other’s way. Sibling relationships can be so complicated! 4. Tell us some more about your zombie love. Any other books or films you’d recommend? I still sometimes find it very odd to be such a huge zombie fan since I hadn’t even thought about zombies until I was in law school and my husband somehow convinced me to go see Dawn of the Dead. But now I’m pretty much a fanatic! And I feel so lucky that zombies have experienced a recent upswing in popularity because I love seeing it all! I think one of my favourite zombie books is Max Brooks’ World War Z -- just really amazingly thought out and told. I’m also a huge fan of The Walking Dead -- both the graphic novel and the TV series based on it. What I love about that series is that Robert Kirkman’s original intent was just to explore a post-zombie-apocalypse world, not have a set and clear arc like most books and movies. That whole premise utterly fascinates me! As for movies, you can’t go wrong with the one that started it all -- Night of the Living Dead -- and I also love Shaun of the Dead because it perfectly mixes happy and sad. And of course I like the remake of Dawn of the Dead just because that’s the one that started it all for me! A big thanks to Carrie for joining in with this series. Remember, if you want to check out who else has been on this already, just click the 'Kiss Me, Kill Me' box somewhere on the right hand side of this blog. BTW, if you've enjoyed this series so far, do feel free to link and retweet, I won't charge you. Next week I will be posting Part 5 of the series, Brenna Yovanoff, author of the wonderfully creepy The Replacement. Soon after will be Becca Fitzpatrick, Holly Black, Melissa de la Cruz and oh so many great authors and their awesome books. Great interview. I absolutely loved The Forst of Hands and Teeth. I'm really looking forward to the third book too. 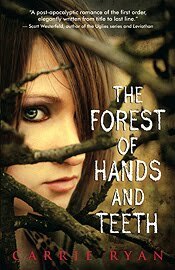 i loved 'The Forest of Hands and Teeth' and read it in 1 day while stuck in hospital after an operation. Such a chilling book and I really loved that it wasn't set in some post-apocalypse landscape but in a world of the past. A real Horror genre gem that was honestly scary. excited for the rest of this series too! Such a great interview. Thank you! Carrie's zombie world is sooo fascinating and it was awesome to see "behind the scenes" so to speak. I've added this to my wish list. You're introducing us to a lot of great books, thanks Sarwat.